This shelf is part of the Closet Culture System and attaches easily to the Closet Culture shelf bracket with required shelf clips (all sold separately). Wood shelves offer a sophisticated look to your home closet and provide functionality that's easy to install. The shelf is made of wood construction with a laminated finish. Impressions 16-inch Narrow Drawer Kit in Chocolate Create your own custom closet with the ClosetMaid Impressions 16 in. Drawer Kit. 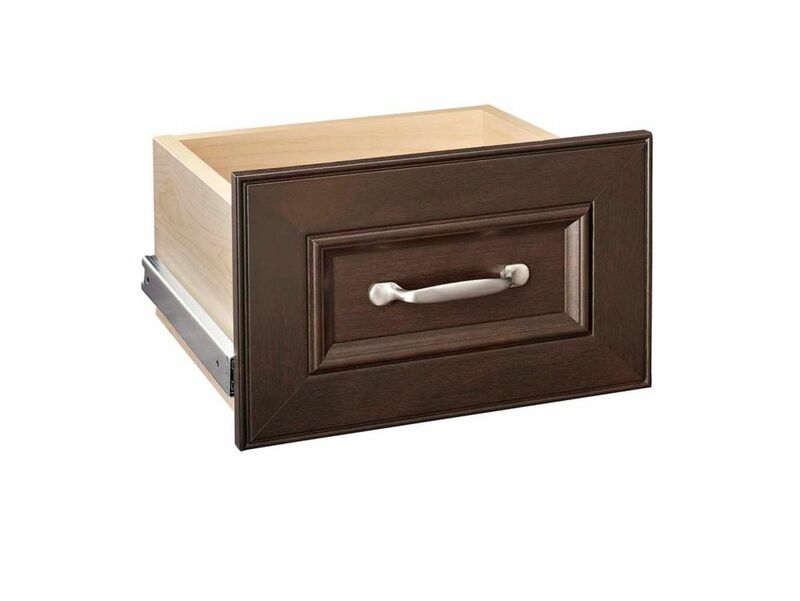 The drawer features a premium, embossed chocolate woodgrain finish with a decorative raised-panel front. A stylish matte silver handle offers a sleek look while the drawer extends fully on smooth, ball-bearing glides. It is designed to work with the ClosetMaid narrow 4-shelf organizer and the narrow closet kit. Impressions 16-inch Narrow Drawer Kit in Chocolate is rated 4.3 out of 5 by 32. Rated 4 out of 5 by Volkom from Quality is better than the actual cabinets these go in... Quality is better than the actual cabinets these go in to. Rated 5 out of 5 by HomeDepotCustomer from The narrow drawers work well if you plan on rolling... The narrow drawers work well if you plan on rolling up the clothes. I store underpants, undershirts, and socks in these drawers.The instructions for putting the units together are easy to follow. Rated 4 out of 5 by Mike from A bit tideous assembling everything but once you assemble youcomponent,... A bit tideous assembling everything but once you assemble youcomponent, you’re somewhat of an expert assemb starts going faster. I think the quality and looks are pretty good. Some pieces were scratched upon unpacking and I had to return several pieces. If you had a reputable company do it, $$$$. Rated 5 out of 5 by Dagro from Easy to assemble and install into our small closet. Easy to assemble and install into our small closet. Rated 5 out of 5 by Erin from Very easy to assemble. One out of four drawers was... Very easy to assemble. One out of four drawers was missing a pre-drilled hole, which was frustrating (Bc of the time lost) but also rather easy to amend for anyone with a drill and drill bits. Rated 4 out of 5 by Linda from The pieces were fairly easy to assemble. The look of... The pieces were fairly easy to assemble. The look of the Unit once assembled is satisfactory. We are happy with it overall.